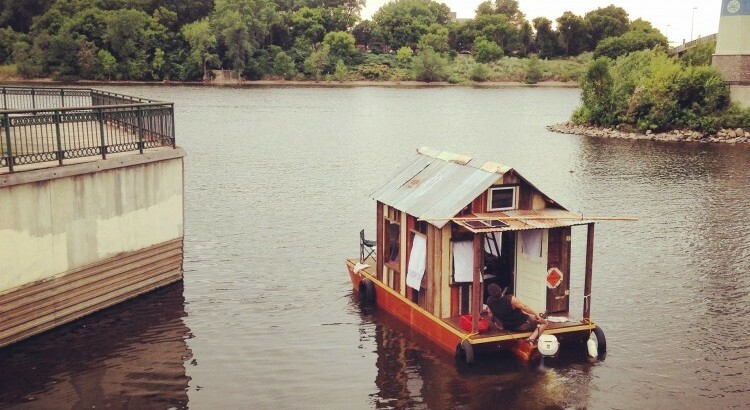 Secret Histories shantyboat in Minneapolis. Photo courtesy of Wes Modes. The Mississippi River runs deep through American culture. From early Native Americans to Mark Twain’s The Adventures of Huckleberry Finn, the Blues and Hurrican Katrina, the history of the country is in constant flux, much like the river itself. The fascination with the mysteries and power of the world’s fourth longest river is subtle, but undeniable. Secret History developed as the basis for Wes Modes’ MFA thesis in the UC-Santa Cruz in Digital Arts and New Media Program, which he completed in April of this year. The project is an exploration of the stories attached to American culture and subcultures through its river systems. By searching for, documenting, and showing the stories by people along the way, Modes plans to stitch together a broader image of past and present culture, contradictory and complementary narratives alike. Wes Modes in the shantyboat. Photo by Matt Jacobson. For the beginning part of the multi-river journey, Modes looks to give a voice to the untold histories of the Big River. His intention is to rediscover the local, personal narratives, regional cultures, and economic tales that have been shaped by living near the Mississippi and the fringes of society. In 2014, Modes spent one month navigating from Minneapolis to La Crosse, Wisconsin. In 2015, he will spend three months total from Winona, Minnesota to St. Louis, Missouri. Modes looks to continue his journey down the Ohio, Missouri and Tennessee Rivers in the future. Part art, part adventure and part historical case-study, Secret History is really a vision to enlighten the modern lifestyle. In true anarchical, DIY fashion, Modes works with a group of people to fulfill a larger vision. Fantasy can become reality if people are given information and precedence to work with. The artist argues alternative lifestyles allow people to remove themselves from mainstream culture, become more creative and lead to a richer and deeper culture overall. It is one giant, collaborative effort that includes the strangers he meets as well as working with the National Park Service or other artists like Twin Cities-based artists Shanai Matteson and Colin Kloecker of Works Progress, a public-based art initiative. Secret History shantyboat outside of the Minnesota History Center in St. Paul. Photo by Matt Jacobson. Modes project has close connections to Minneapolis’ own famed photographer Alec Soth, who’s project Sleeping on the Mississippi and subsequence photography projects locates characters on the margins of society. Modes has a similar search of the peripheries. Rather than using the deadpan style associated with Soth that allows for the viewer to complete the narrative using the framed imagery, Modes directs those who look to a more complete story through interactive browsing of his archives. 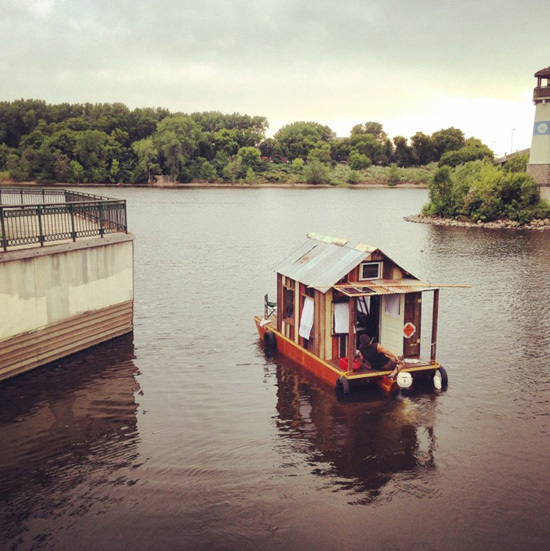 Another local project that bares resemblance to Secret History is the Art Shanty Projects on the frozen White Bear Lake west of Minneapolis. The larger scope of Secret History has taken on the life of a documentary and a call to perspective Do-It-Yourselfers. The form of art and practice of artful living becomes the difference. Meeting with Modes for questions resulted in broken sentences and thoughts due to the high volume of visitors to his shantyboat and his genuine desire to connect with every person that throws a glance towards the boat. It became apparent that Modes’ form of art was less the installation in the lobby than connecting with people and the actual adventure of it all. Similar to the stories Modes digs for from years ago, he is creating his own history and process of art making. Unlikely to fit categorically, Secret Historybecomes a fringe-style of art making itself. 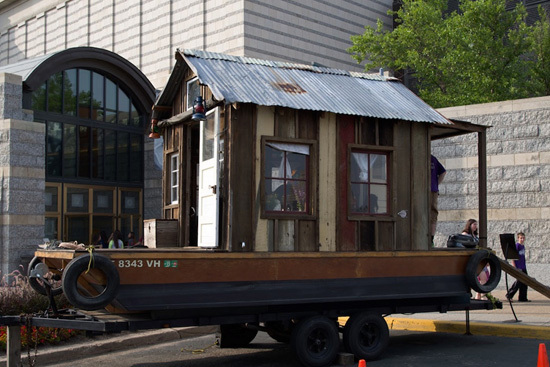 Recent displays of the shantyboat and installation were during the River City Revue at the Minnesota Historic Center in St. Paul on June 30 and at the National Mississippi River Museum in Dubuque, Iowa in early August. To search the archives, find upcoming installations or follow Wes Modes and Secret History of American River People, check out the following websites: peoplesriverhistory.us, modes.io.